"Tastes just like lasagna! Wow! 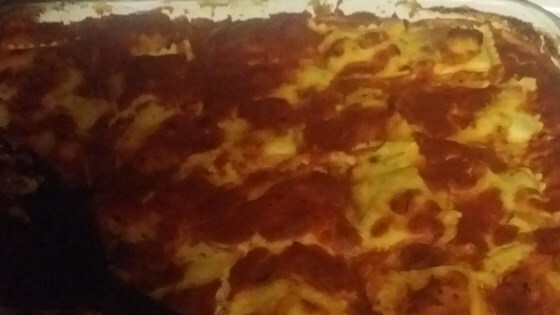 Everyone is amazed how easy this is, and how much it tastes just like lasagna! This one's DEFINITELY a keeper! So easy!" Preheat an oven to 375 degrees F (190 degrees C). Spray an 8x8 inch baking dish with cooking spray and set aside. Mix the ricotta cheese, spinach, 1 1/2 cups Romano cheese, eggs, salt and pepper to taste in a bowl. To assemble the lasagna, spread 1/4 cup of spaghetti sauce in the bottom of the prepared baking dish, and place frozen raviolis on top in a single layer. Spread about 1 cup of the ricotta mixture over the raviolis. Repeat the layers 3 more times, ending with a layer of frozen raviolis. Spread with 1/2 cup spaghetti sauce, and sprinkle remaining 1/2 cup of Romano cheese on top. Cover the dish with aluminum foil. Bake in the preheated oven for 40 minutes, until the casserole is bubbling. Then remove the aluminum foil, and bake another 10 minutes to brown the cheese on top. Let sit for 10 minutes before serving. The flavor was OK, but I didn't like the texture of the ravioli after it was baked. Some of them were a little chewy, some were gummy and some were crunchy. not bad it was fast easy and almost like lasagna. its great if you want to make a nice meal but skip the work to make real lasagna. Very good and very easy, the kids loved it. Awesome for a quick & easy meal. Tasty! I have some spinach haters so I used some cokked zuchini instead. Loved it! this is good, but not great. Hubby was not impressed, but my child gave it a thumbs up. Would make again.